Bed Size up to Left to Right 120" - Front to Back 72"
Shut Height up to 33.5"
Tool Complexity: Line to Progressive Dies including in die tapping and in die copper insertion. Extensive collection of flexible tooling. GB offers a large range of machining options, from one off to production volumes. It is uncommon in the machining industry for a company to offer the high volume capacity of horizontal CNC machining centers, sitting beside long table vertical CNC machining centers for large parts. Turning is available on our bar feed CNC lathes. Blanchard, surface, and OD grinding, along with honing are also in-house capabilities available at GB. While we are proud of our in-house die design and build successes, the addition of production machining has proved to be a capability our customers have found a good fit for their needs. CNC Horizontal Machining Center – 500 mm dual pallets, 40 station tool changer, 50 taper. Our experienced paint professionals apply a flawless finish to your product in the color of your choice, providing superior corrosion protection at a reasonable price. We have both automatic and manual lines handling the heaviest volume to one off projects. The automatic line has a multi-stage wash system and paint booths offering the option of primer and/or top coat. The manual station is set up for short run batch processing and big enough to accommodate a full size automobile. Custom racking suits any project needs and custom packing is available upon request. 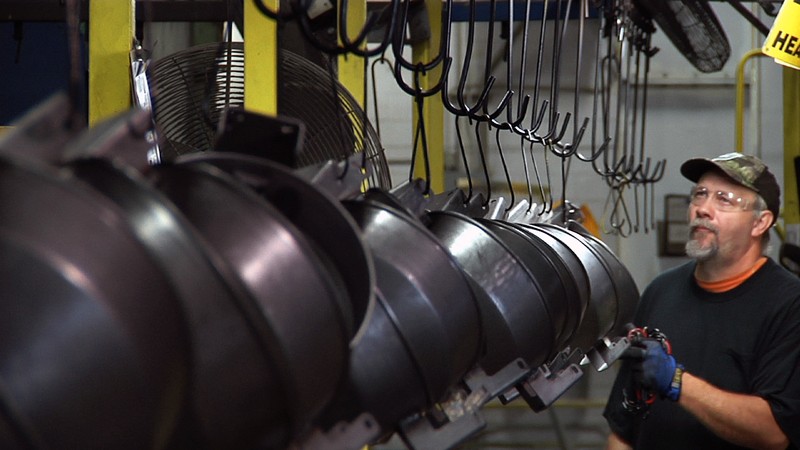 Our flexible manufacturing techniques allow us to partner with customers from start to finish. We can make your prototype or launch into full scale production, literally making anything from metal. We have the capability to right size the investment to your volume demand. Consisting of as many as 100 components with the complexity of building a complete crane cab. For our customer production line side needs and sequencing. "Ready to ship" prepackaging for our resale customers. GB Manufacturing started out as a tool and die shop in 1977. We have full service capabilities to reduce cost, lead time, and improve control and quality for our customers. Additional capacity can be added through our regional partners and strategic alliances while utilizing our expertise.